The vegan journey of Maui musician-publisher-activist-philosopher Carlos Garcia began about 16 years ago in Los Angeles. “While distributing free magazines, I found an advertisement for a Music and Healthy Food Festival,” he recalls. “It looked good, so I volunteered.” To avoid turning off people, the festival wasn’t advertised as a vegan event, but it was. A few years later Carlos made another big change. One day in 2007 he was stuck in Los Angeles traffic, and it took over an hour to go three quarters of a mile. This was the last straw. Carlos had enjoyed past visits to Maui and decided to make a permanent move. Within weeks after his arrival, everything began to fall into place. For over a decade Carlos has been a stalwart of the Maui vegan scene, organizing events, developing projects, building community, playing drums for many local and international musicians and spreading the vegan word. “I want Living Aloha to become a mainstream publication with a strong vegan message. Not many people go from McDonald’s to reading VegNews, but, attracted to topics like health, massage and natural foods, they might go from McDonald’s to Living Aloha,” he reasons. “Once you’ve got their attention, you can introduce vegan themes about protecting the environment and being happy without meat and dairy products. 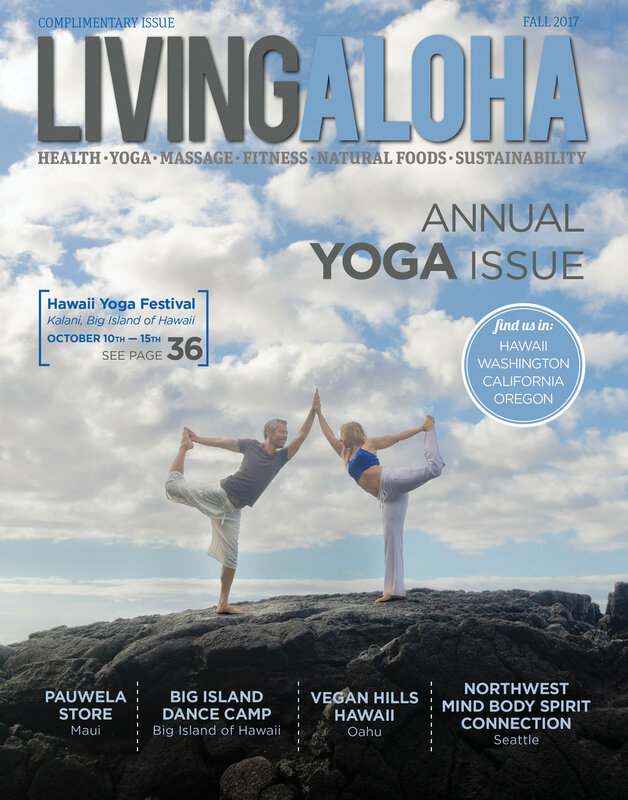 Each issue of Living Aloha features a vegan section that grabs your heart. Carlos envisions a second vehicle for sharing, a Living Aloha Center on Maui. This health-music-dance complex with all-vegan restaurants and shops would include consulting on diet, lifestyle and cooking. If you are interested in getting involved, Carlos welcomes volunteers with publishing experience to write articles or develop advertising sales. Carlos may be contacted at carlos@livingaloha.net or 310-488-1911.